As the saying goes, with a great playoff team comes great responsibility, at least, more often than not, from a financial standpoint. At the end of the day, the health and state of various franchises will hang on playoff performance, and it’s ultimately a massive variable when it comes to the mindset (if not the generally hefty financial demands) of pending free agents. With the playoffs underway, here’s a cursory look at the high-profile teams and free agents that could be most impacted by the events of the next few weeks. It was less the result and more the manner in which the Sixers fell to the Nets on Saturday that raised some yellow flags, particularly given how much Philadelphia has riding on these playoffs. The midseason acquisitions of Jimmy Butler and Tobias Harris poured gasoline on the flames in terms of immediate expectations; both players will be unrestricted free agents (Butler will likely opt out of his contract) and came at significant cost. The public stance has been that the organization wants to keep both players, but actually getting to that point might take some positive playoff results. Whether Butler and Harris are truly max-contract players is certainly debatable, but both players seem likely to command something at or close to a maximum number on the market, and the Sixers, as constituted, can’t afford to lose both, particularly given the capital they sacrificed to acquire them. Complicating matters is the fact that Ben Simmons will also be up for a max-caliber extension. It’s unclear if this is a situation where winning might solve everything—particularly noting Butler’s general prickliness—but Philly is operating under the microscope nonetheless. Whether there’s a crisis or not, it’s early to call, but if these pieces don’t fit and the Sixers aren’t on an upward trajectory by the end of the playoffs, there’s going to be some fallout. The Raptors’ Game 1 loss to the Magic may not have them sweating bullets, but their playoff performances matter not only in the sense that this is a team built for May and June, but also in the context of trying to convince Kawhi Leonard to stay. Will winning a title, or perhaps more realistically, making the franchise’s first trip to the Finals be enough to fete Leonard’s interest in sticking around? That gambit was successful during the season, but will come to a head after the playoffs, and it’s likely Leonard will take meetings and hear out his options. Toronto wouldn’t be totally broken if Kawhi were to walk, but certainly, that’s a hole the Raptors aren’t patching in one swoop. Winning the East, contending for a title, and offering a chance to do it again with the same group would certainly be the best possible recruiting tactic. Danny Green is Toronto’s only other key free agent, noting that Marc Gasol won’t get $25 million anywhere else if he opts out. Pascal Siakam will be up for a nice extension. There’s a winning core in place here. Rival teams aiming to coax Leonard back stateside will be hoping for the Raptors’ swift exit. 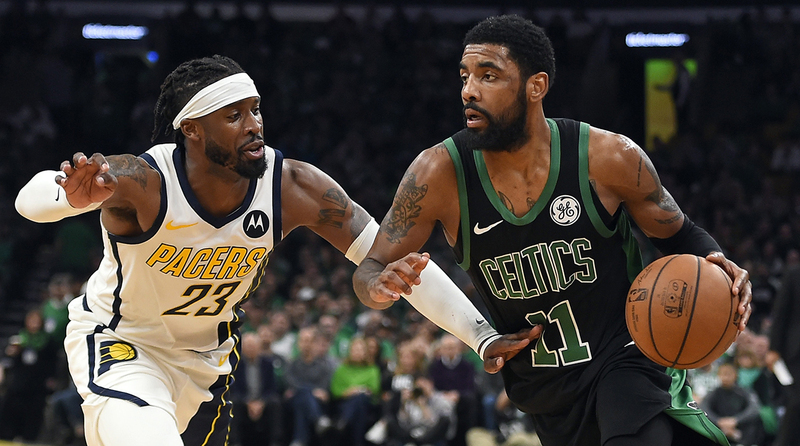 While it’s more or less foregone that Kyrie Irving opts out of his contract, it’s less clear as to whether he’ll end up sticking around in Boston. The Celtics would certainly like him back, and that would seem to be Plan A. Still, Irving has never done the free agent thing before, and will end up with alluring options. With the way the Celtics’ season has sputtered out down the stretch, there’s a good bit riding on the possibility of gathering any momentum here. Advancing past the Oladipo-less Pacers to draw the Bucks is probably the bare minimum in terms of expectations. The other factor with Irving and the Celtics is the eventual fate of Anthony Davis, whose trade request will be item No. 1 on the list for David Griffin as he takes over basketball operations with the Pelicans. Davis has previously postured to avoid Boston, and there’s a thought that Irving would need to be present for him to consider playing there; whether those two things are connected is unclear. Still, Boston has three first-round picks and might end up with a fourth depending on what happens with the Grizzlies’ selection, which conveys to them if outside the first eight spots. It will be curious to see what course of action the Celtics choose, and whether or not it includes Irving. The Warriors’ entire season has creeped along to this particular juncture, and it’s beyond your traditional title-or-bust type deal. Three-peat or not, Kevin Durant will opt out of his contract and weigh a potential move. Klay Thompson is going to be an unrestricted free agent for the first time, and command max-type money. The Warriors might not be able to afford DeMarcus Cousins’ next contract, and may not want to given his recent quad injury. Draymond Green, Andre Iguodala and Shaun Livingston are all another year away from free agency. Stating the obvious, Golden State has big financial decisions to make, and with some immediacy. They’ve won so big and so often that any recruitments may not be results-driven. They’ll still be an arm’s length from contention next season, and one would guess that keeping Thompson at whatever price becomes paramount. The Warriors can’t count on having Durant back, and it’s unclear what happens with Cousins. Winning big again won’t hurt the cause, but this might be more complicated than that.